The difference between other software and IPsynchro, is that IPsynchro learns to retrieve your external IP address directly from your WAN modem or from any WebPage, showing to you, your external IP address. 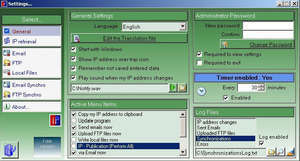 Update files on your pc (like Windows Remote Desktop Connection files), with the ip address of other computers also using IPsyncro, or perform various automated tasks. For security reasons, you should also check out the IPsynchro download at LO4D.com which includes virus and malware tests. Additional screenshots of this application download may be available, too.